I asked Jonathan Towne for permission to use his character Titus, and Jeff Wells for permission to use his character Ginny (who appears briefly near the end of this storyline) way back at the first Narbonicon. I really enjoyed their characters’ personalities and give-and-take. I hope I did them justice, especially Titus, who’s a great cranky henchman guy. I really was playing a lot of “Donkey Kong Country” around this time. I need to replay DKC. I’ve beaten DKC2 and 3 twice. 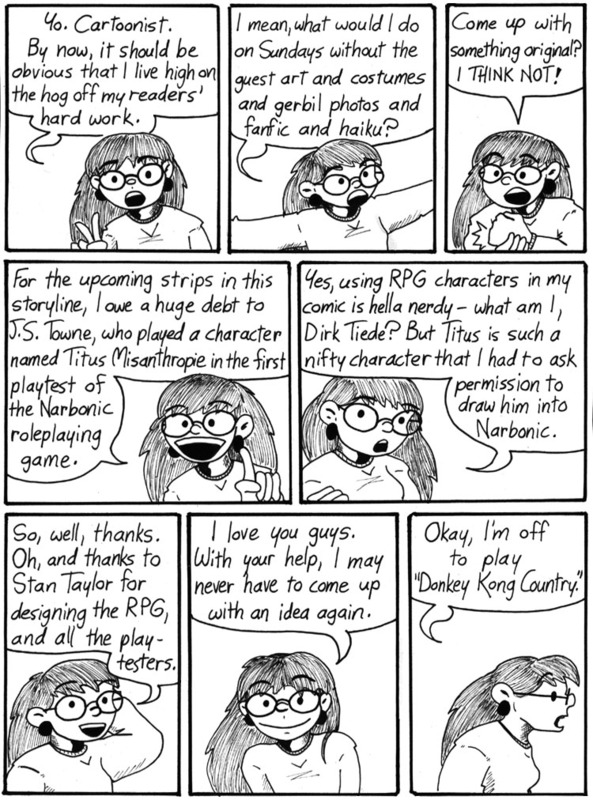 Please, please, please, pretty please hurry up and finish the Narbonic/Skin Horse RPG so we can have fun with it too! What ever happened to the Narbonic RPG? I never did see more than a few fragments of rules. I still think Risus would be a pretty good base, arguably better than the Amber-style rules. Yes! That deserves to be finished, and maybe expanded into the Narbonic/Skin Horse RPG and Resource Book, much like how Guardians of Order did for the first two seasons of original Sailor Moon, the first seven(?) eps of Tenchi Muyo! OVA, and Dominion Tank Police. Come to think of it, maybe you folks could modify the Tri-Stat System used in Big Eyes, Small Mouth and its spinoffs (mentioned above) to work with the Narbonic/Skin Horse RPG? How am I supposed to write a filk about Titus? Aside from the fact that I just used the melody to “Macavity” at Skin Horse today, what the heck rhymes with “Misanthropie”? Hey, Ed, if Weird Al can put midichlorians in a song, it can be done. Ed: lycanthropy, the man for me . . .
Titus and Ginny are pretty awesome characters. @Ed – can you rhyme anything off of “Titus”?